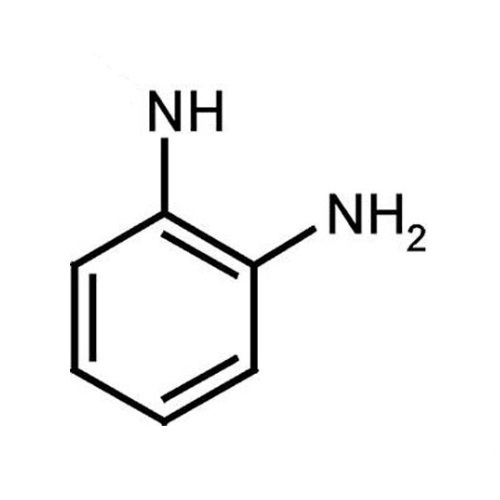 o-Phenylenediamine is an organic compound with the formula C6H4(NH2)2. This aromatic diamine is an important precursor to many heterocyclic compounds. It is isomericwith m-phenylenediamine and p-phenylenediamine, and is commonly referred to as OPDA. o-Phenylenediamine condenses with ketones and aldehydes to give rise to a variety of useful products. Reactions with carboxylic acids and their derivatives afford benzimidazoles. The herbicide is prepared in this manner. Also, quinoxalinedione may be prepared by condensation of o-phenylenediamine with dimethyl oxalate. Condensation with xanthate esters affords mercaptoimidazoles, which are used as antioxidants in rubber products. Treatment with nitrous acid gives benzotriazole, a corrosion inhibitor. Condensation of substituted o-phenylenediamine with various diketones is used in the preparation of a variety of pharmaceuticals.In coordination chemistry, phenylenediamine is an important ligand precursor. Schiff base derivatives, such as those derived from salicylaldehyde, are excellent chelating ligands. Oxidation of its metal-phenylenediamine complexes affords the diimine derivatives, which are intensely colored and often exist in multiple stable oxidation states.